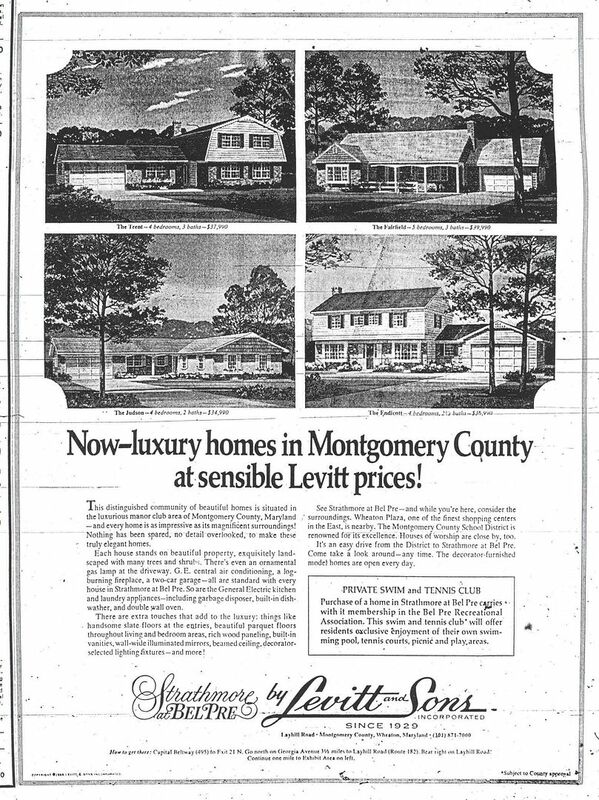 is Levitt's upscale community in Montgomery County, Md. Situated in the Aspen Hill-Wheaton area, the community is only a few miles outside the Capital Beltway, north of Washington, D.C.
W H E A T O N , M D .
Location: Near the Town of Wheaton in the Aspen Hill section of Montgomery County, Md. Strathmore at Bel Pre Exhibit Center and sample homes located on Rockview Court and Hathaway Drive off Layhill Road (Route Md. 182). The community is located off Bel Pre Road. Official web site for Strathmore at Bel Pre. Tour all four sample homes and select the style of your new home in the exclusive community of Strathmore at Bel Pre. 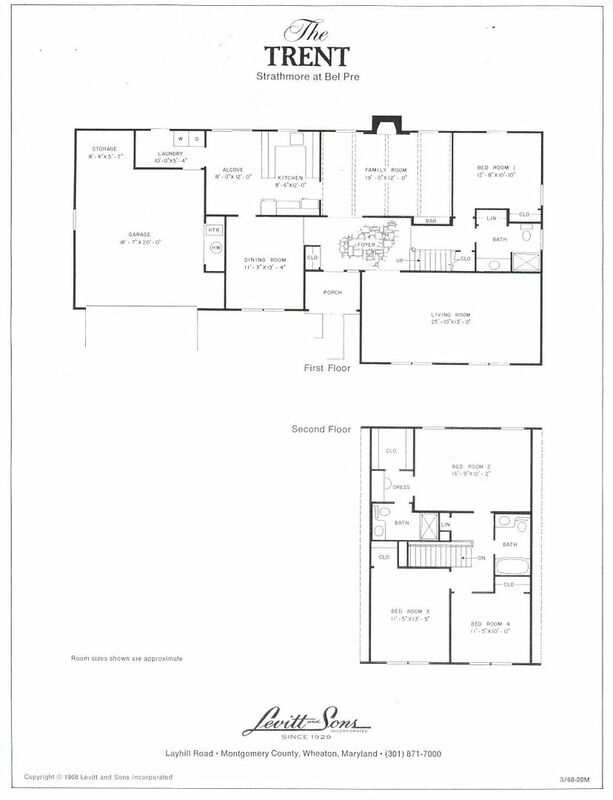 Two-car garages are standard on all models, and basements are available on selected homesites. Rancher. 4 Bedrooms, 2 Baths, Brick front, Covered Entry, Slate Entry Foyer with Dual Closet, Living and Sleeping areas with polished Hardwood Floors, Living-Dining Room with Optional Fireplace, Front-to-Rear paneled Family Room with Fireplace, Beamed Ceiling, adjoining Breakfast Alcove and Sliders to back lawn, Main Bath with Double-bowl Vanity, Laundry Room with Garage access, Two-car Garage with Utility and Storage Areas, Overhead Storage and Pull-down Stairway and Optional Side Entry, Optional Basement. Center-hall Colonial. 4 Bedrooms, 2-1/2 Baths, Cut Stone front, Slate Entry Foyer, Living and Sleeping areas with polished Hardwood Floors, Front-to-Rear Living Room with Box Window, Formal Dining Room with Box Window, Kitchen with Alcove, Paneled Family Room with Beamed Ceiling and Optional Fireplace, Separate Laundry Room, Two-car Garage with Storage Area, Overhead Storage with Pull-down Stairway and Optional Side Entry, Optional Basement. 2-story Dutch Colonial. 4 Bedrooms, 3 Baths, Brick front, Covered Entry, Slate Entry Foyer with Guest Closet, Living and Sleeping areas with polished Hardwood Floors, Front-facing Living Room, Front-facing Dining Room, Paneled Family Room Beamed Ceiling, Fireplace, and Built-in Bar, Kitchen with Serving Counter and Breakfast Alcove with Sliders to back lawn, First-floor Bedroom or Den and Full Bath with Stall Shower and Oversized Linen Closet, Master Bedroom with Separate Dressing Area, Walk-in Closet, Bedroom 3 with Walk-in Closet, Laundry Room with Garage Access and Service Door to back lawn, Two-car Garage with Storage Area, Overhead Storage with Pull-down Staircase, and separate Utility Area. 1-1/2-story Farmhouse. 5 Bedrooms, 3 Baths, Cut Stone front with Portico, Slate Entry Foyer, Living Room with Bay Window, Formal Dining Room, Family Room with Sliders to back lawn and Serving Counter from Kitchen, Laundry Room with Garage access, First-floor Master Suite with two closets, Bath 3 with Double-bowl Vanity, Two-car Garage with Utility and Storage Areas, Overhead Storage and Pull-down Stairway, Optional Side Entry. View the Front Cover and Back Cover of the folder for Strathmore at Bel Pre. 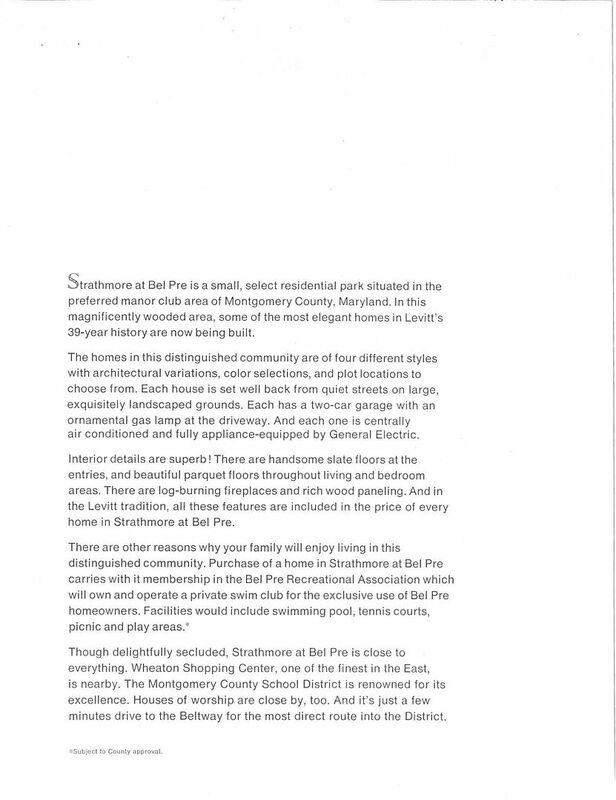 View the Community Profile for Strathmore at Bel Pre--Levitt's exclusive residential park in the desireable manor club area of Montgomery County. View the Location Map for Strathmore at Bel Pre. See how convenient Strathmore is to the Beltway and to Downtown Washington. 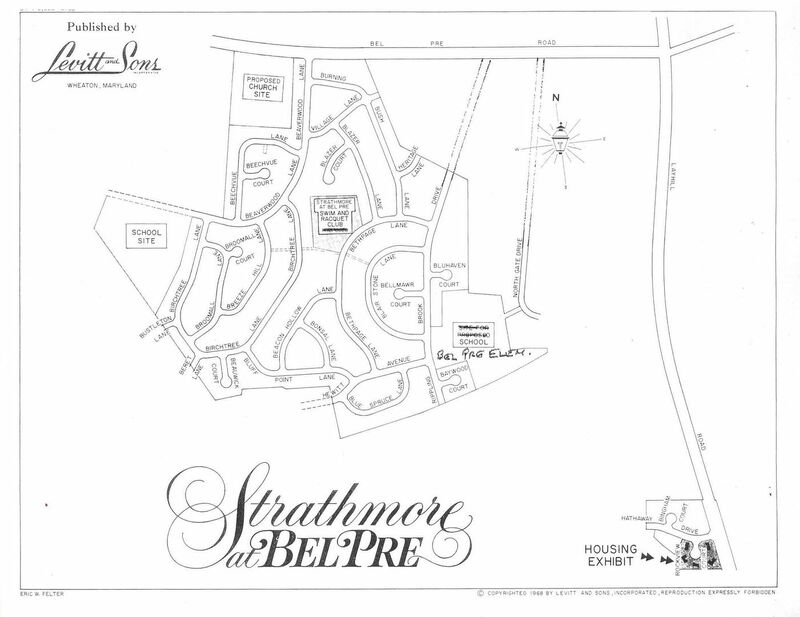 View the Community Plan for Strathmore at Bel Pre--here you'll find the Swim and Racquet Club at the center of the community. And the Elementary School is just a short walk. View the Cover of the Swim and Racquet Club profile. 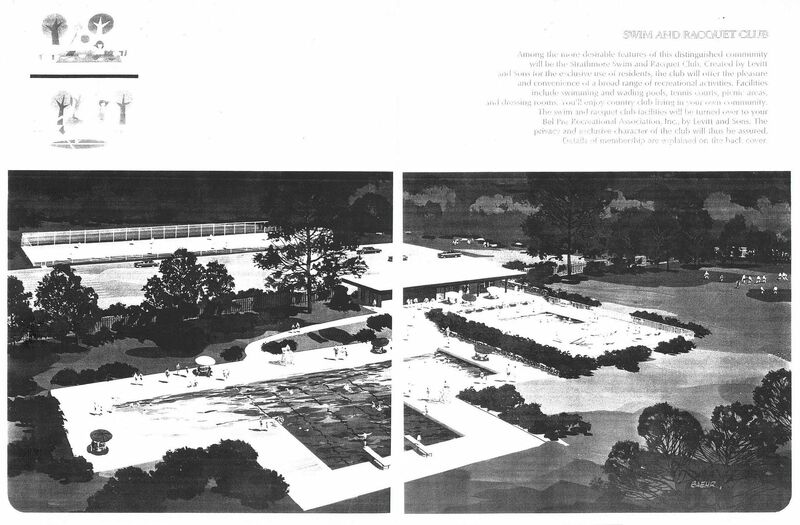 View the Rendering and Profile for the Swim and Racquet Club. 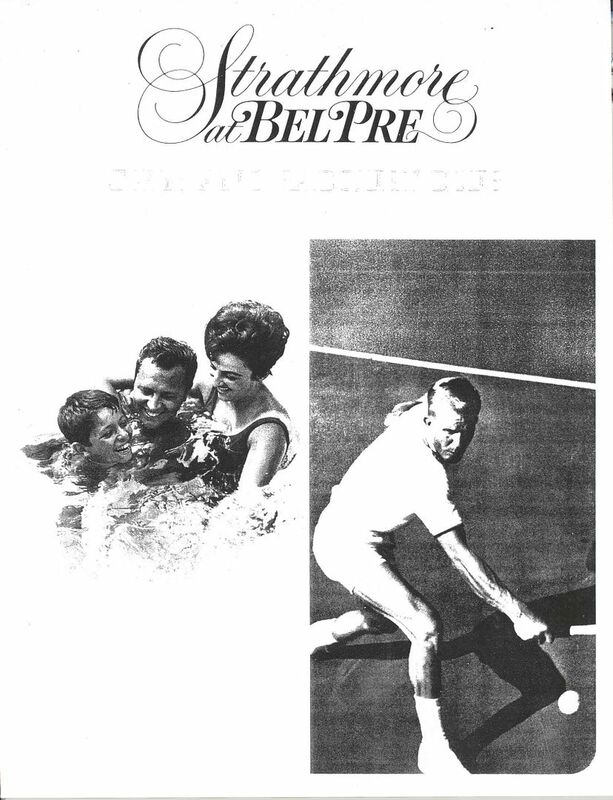 View the information for the Bel Pre Recreational Association. 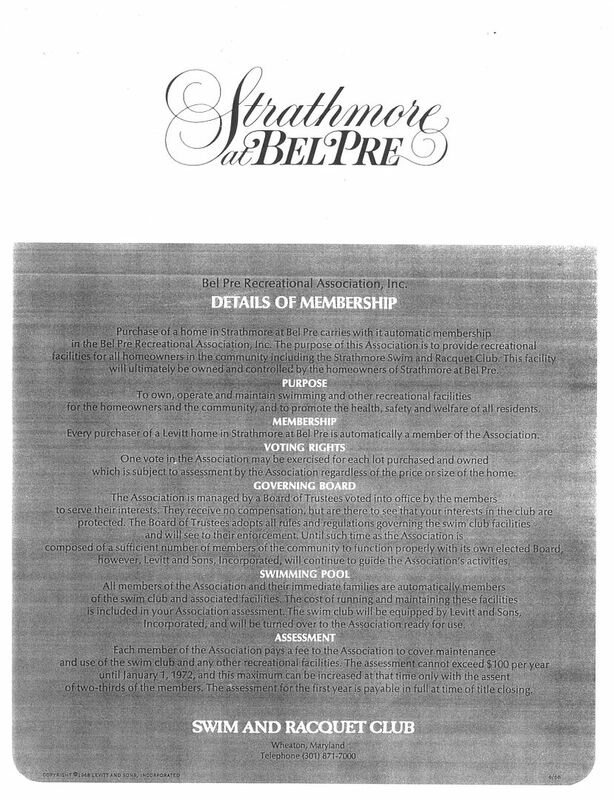 Membership in the Association is automatic with the purchase of a home at Strathmore at Bel Pre. View the Price List for the homes and homesite options. View the Options List for such items as storm windows, upgraded appliances, fireplace, and bedrooms painted in your choice of one of seven pastel colors. Buyers may purchase additional items from Levittmark after contract signing. Tour all six sample homes and select the style of your new home in the exclusive community of Strathmore at Bel Pre. Two-car garages are standard on all models, and optional features such as a basement and side-entry garage are available on select models. 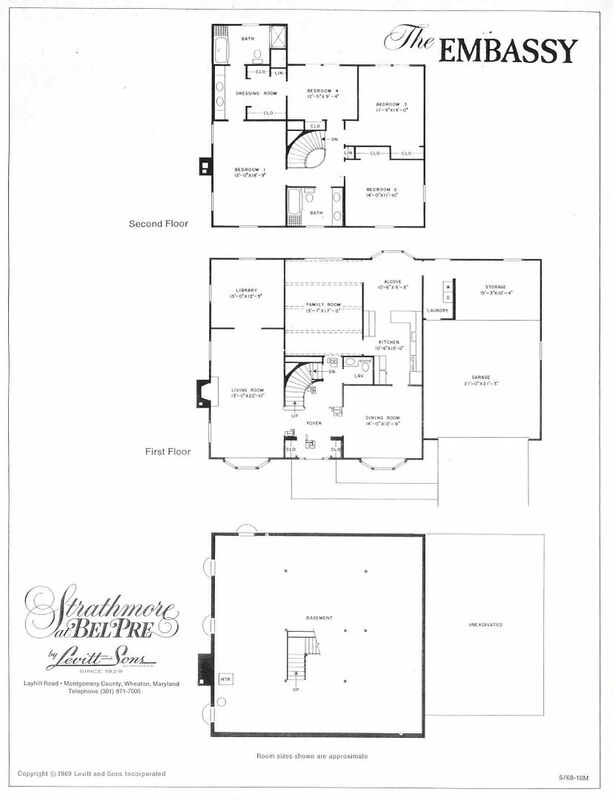 Strathmore is Levitt's upscale single-family home community in Montgomery County. Atrium Ranch. 4 Bedrooms, 2 Baths, Brick front, Gated Garden Atrium Entry, Covered Entry, Slate Entry Foyer with Beamed Ceiling, Living and Sleeping Areas with polished Hardwood Floors, Rear-facing Living Room with Beamed Ceiling, Fireplace, and Optional Conversation Pit, Kitchen with Luminous Ceiling, Walk-in Pantry, and Breakfast Alcove with door to front Garden Atrium patio area, Family Room with Beamed Ceiling and Sliders to back lawn, Main Bath with separate Bath and Double-bowl Vanity areas with Linen Closet, Master Bath with Separate Double-bowl Vanity and Bath areas and Dressing Room, Optional Paneled Den with opening to Foyer in place of Bedroom 4, Separate Laundry Room with Service Door to side lawn and Garage access, Two-car Garage, Partial Daylight Basement with Utility Area. Center-hall Colonial. 4 Bedrooms, 2-1/2 Baths, Brick front, Slate Entry Foyer with Curved Staircase and Dual Guest Closets, Living Room with bay window, Fireplace, and separate paneled Library with Optional Fireplace, Formal Dining Room with bay window, Kitchen with Luminous Ceiling and Serving Counter, adjoining Breakfast Alcove with bay window, Family Room with Beamed Ceiling, Sliders to back lawn, and Optional Fireplace, Laundry Room with Garage access and Service Door to back lawn, Two-car Garage with Oversized Storage Area, Optional Maid's Room with Full Bath in place of Garage Storage Area, Daylight Basement with Utility Area. 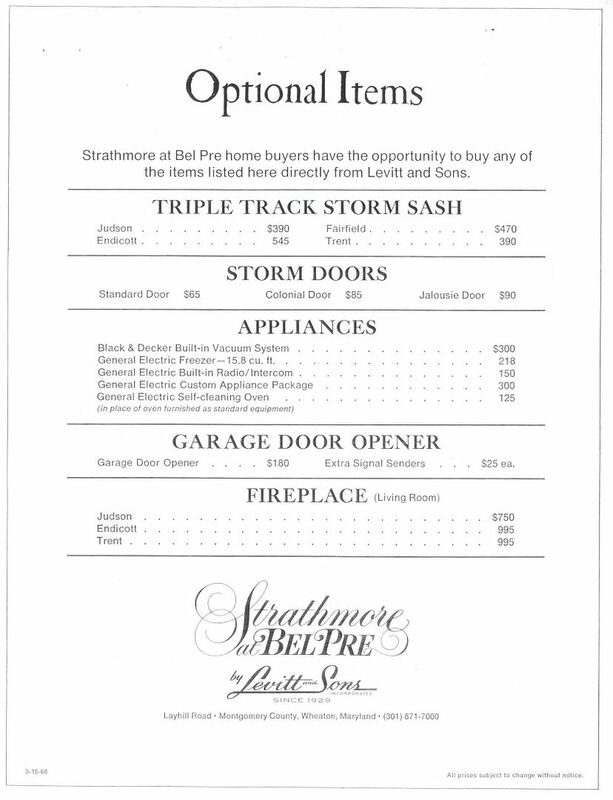 View original newspaper sales advertisements for Strathmore at Bel Pre. 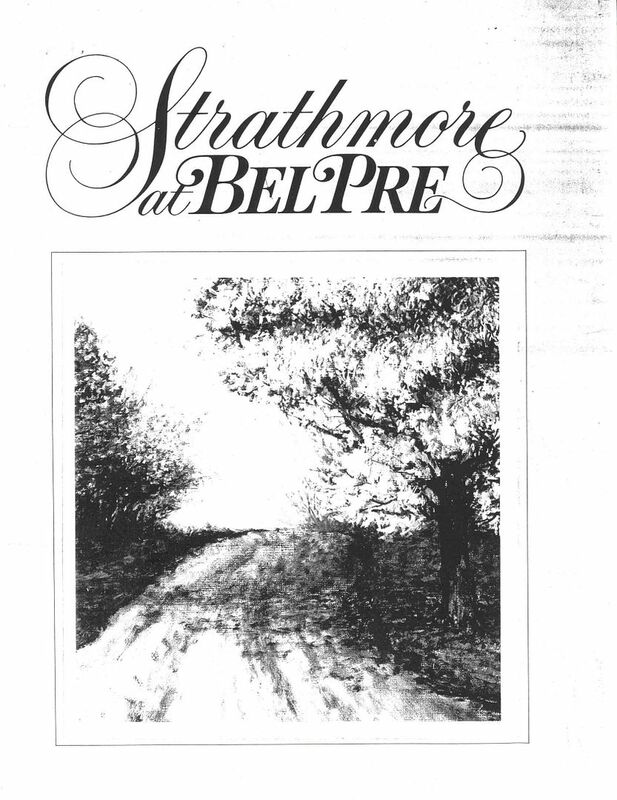 A companion community to Strathmore at Bel Pre opened in 1971. 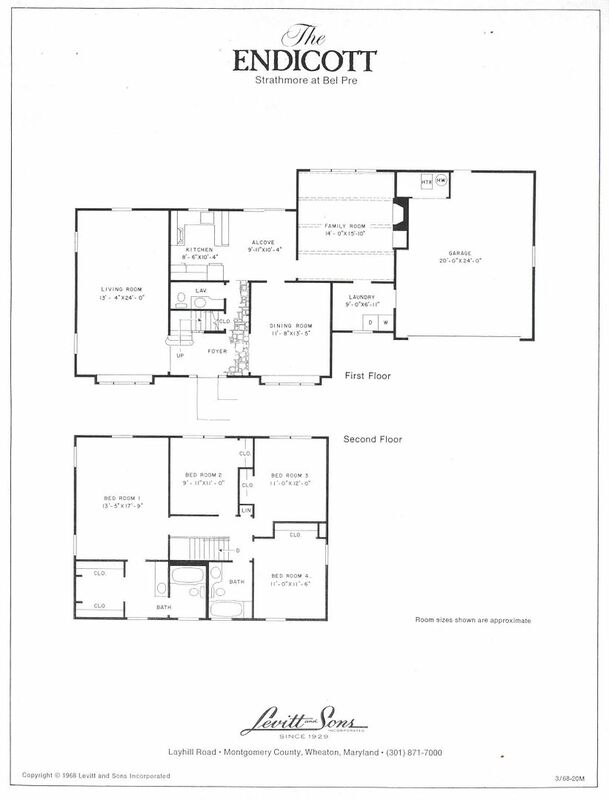 Called Parc Bel Pre, it offerred the same four original models as Strathmore, but not the Blair or Embassy models. Actually another section of Strathmore, but advertised separately, Parc Bel Pre is adjacent to Strathmore but physically separated by a wooded preserve. Strathmore at Bel Pre is Levitt's exclusive community. 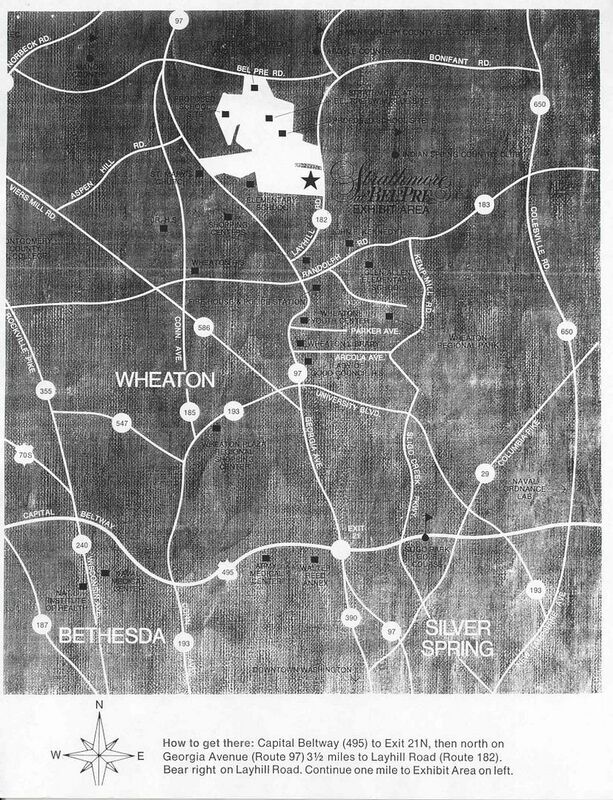 Even in 1966, when Levitt purchased the property, Montgomery County was already heavily developed. It is somewhat unusual for Levitt to have selected a site that was essentially within the fringe of a developed area, rather than just beyond it. 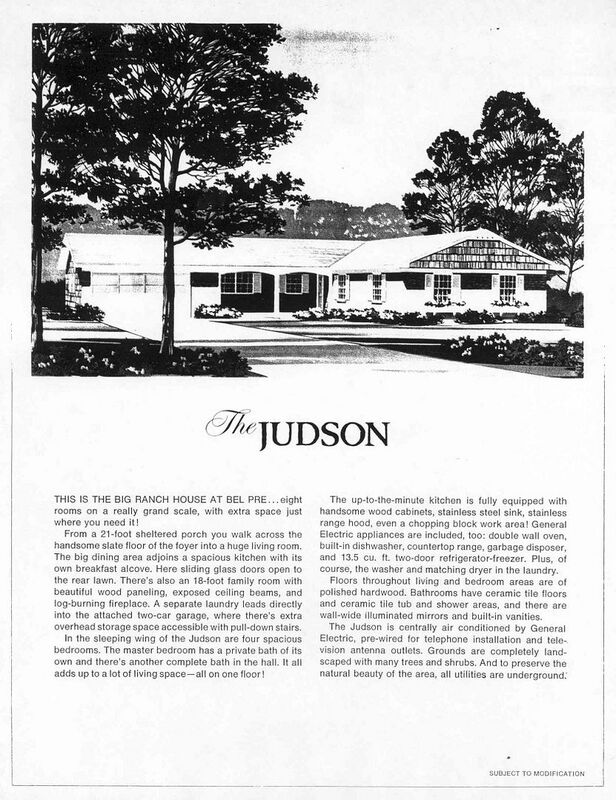 As such, with higher land prices, higher priced homes were offered when the community opened in 1968 with more amenities such as a private Swim and Tennis Club, larger wooded lots with generous setbacks and rolling terrain, curving streets rather than a warped grid pattern, many culs-de-sac with a landscaped center island at the end. In addition, the homes had more amenities as well. 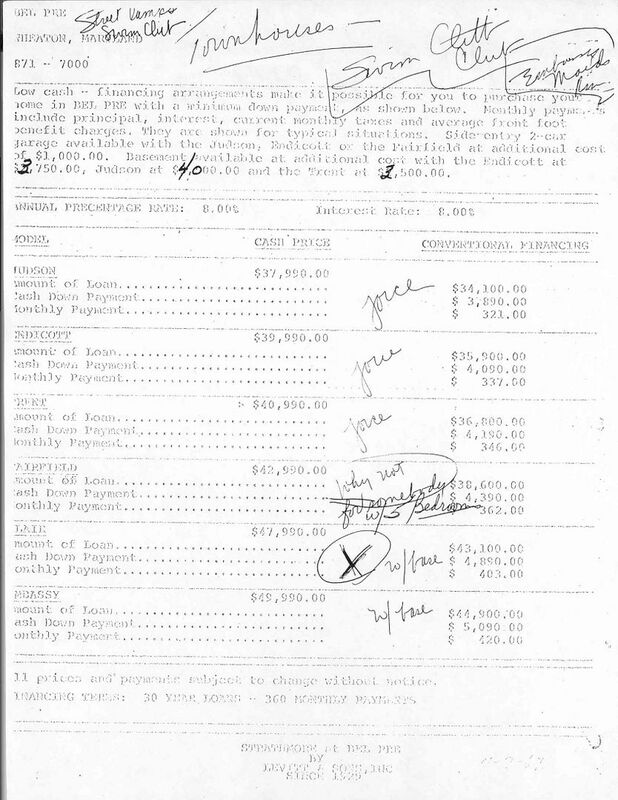 Although they were the larger of the same basic homes that were being offered in other Levitt communities, additional standard features were included in the sale price, such as fireplace, slate entry, and hardwood floors. In addition, the luxury versions of the standard models were renamed to distinguish them from the standard version of the models. At the outset of the community, only four models were available. 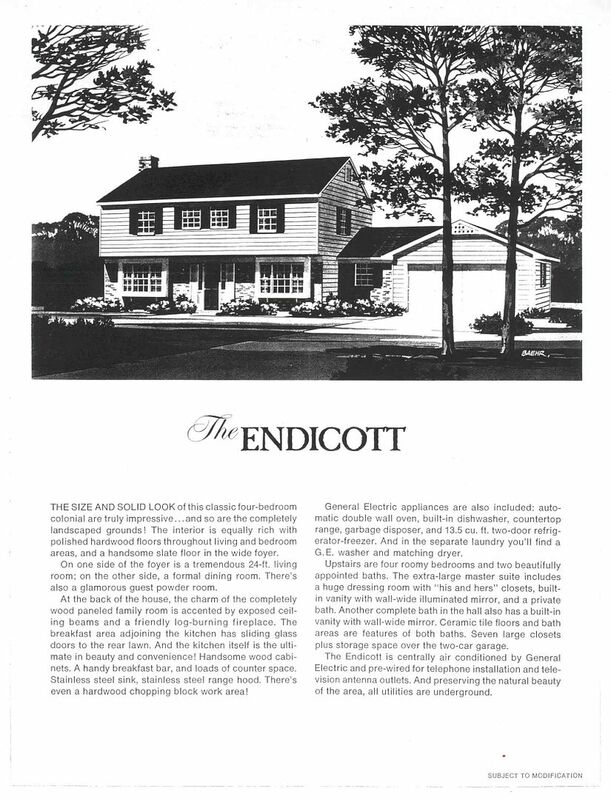 Three of them were familiar homes from Levitt's standard houselines, with additional standard features and new names. 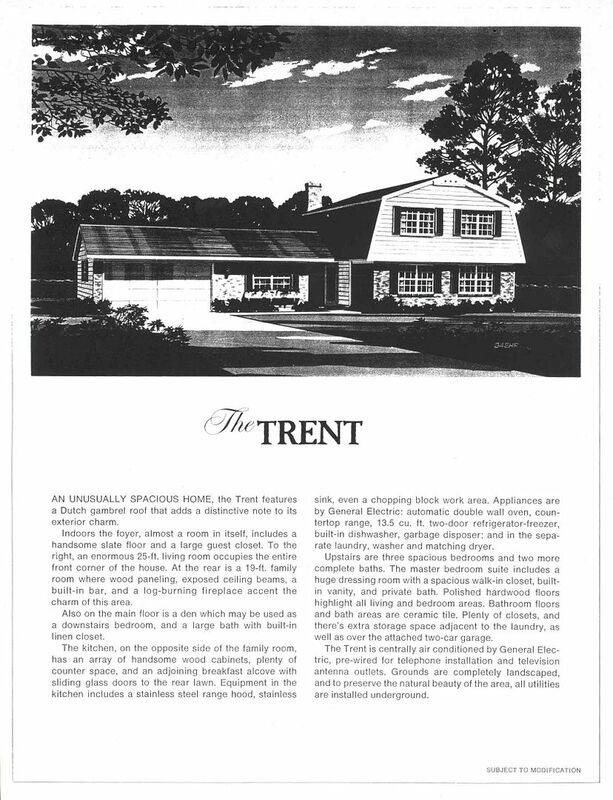 The Trent was a newcomer and a large home at that. 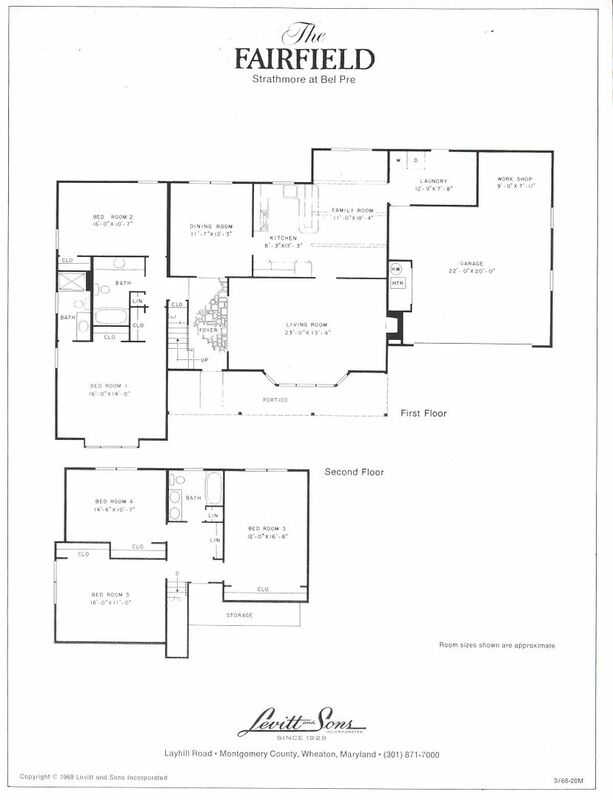 Offered in Levitt's upscale communities (including Woodlawn Manor in Upper Marlboro, Md. as the Tennyson), the Trent was one of the largest models in terms of floor area, though the Fairfield (the Framingham in the standard houseline) still had it beat in terms of the number of bedrooms. 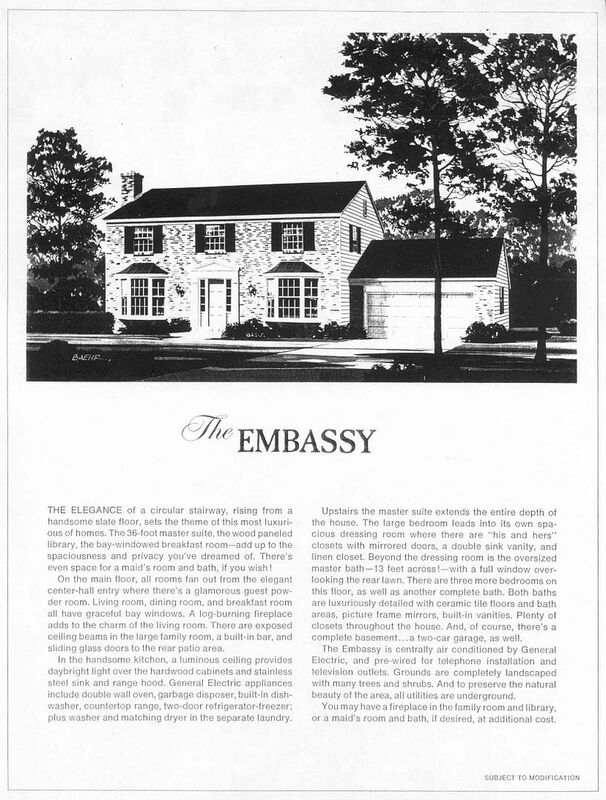 In 1969, just in time for the start of Levitt's fifth decade as a homebuilder, two new models were added to the Strathmore at Bel Pre houseline--the Blair and the Embassy. 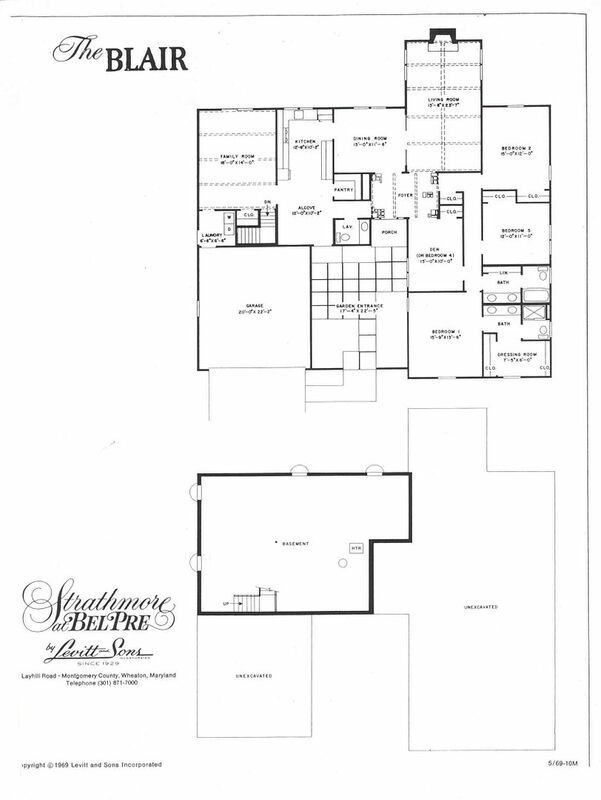 These were very large homes with such luxury features as luminous kitchen ceilings, curved staircases, fireplace conversation pits, and gated garden atrium front entries. Also included with the sale price was a basement--optional features when offered in the models that remained from the 1966 houseline. 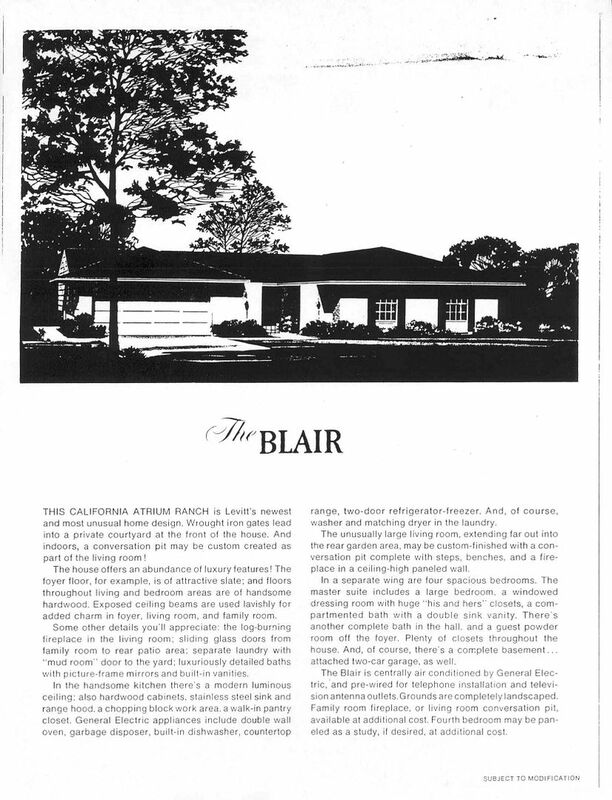 The Blair model was truly a unique home when it debuted in 1969. 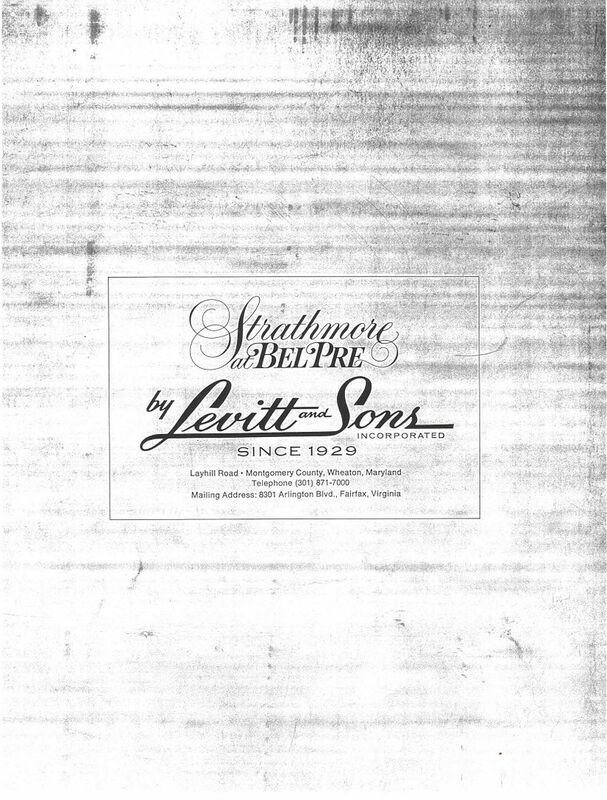 It was featured on the cover of the October 1969 issue of Professional Builder magazine, which profiled Levitt and Sons in its 40th year of business. 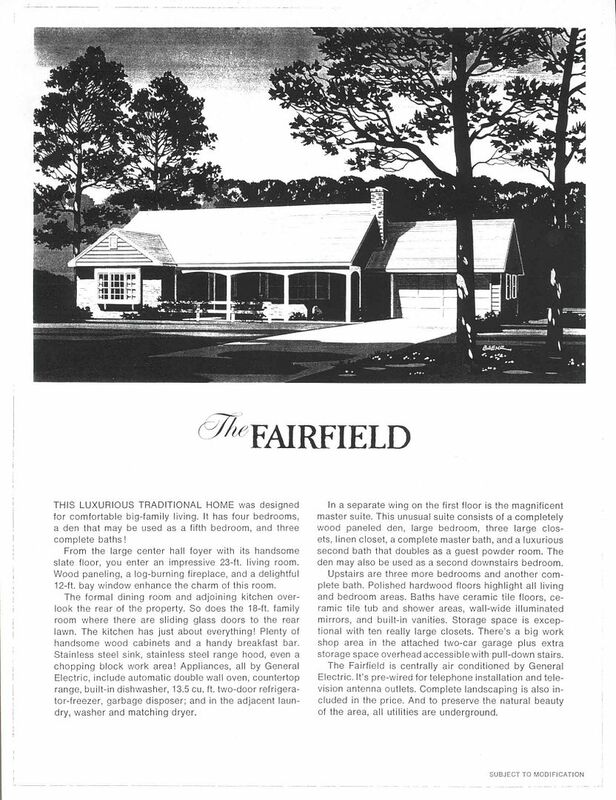 The Blair was introduced into the houselines as the Blair, Bentley, or Berkshire model at several of Levitt's upscale communities, including Strathmore at Huntington in Dix Hills, N.Y., Crofton Woods in Crofton, Md., and Woodlawn Manor in Upper Marlboro, Md. This model was somewhat contemporary in nature, even though it was finished in a traditional exterior. Likely inspired by Spanish villa style, the gated atrium area in the front of the house with access from the kitchen made for an informal outdoor dining area and a welcoming entry court for guests. 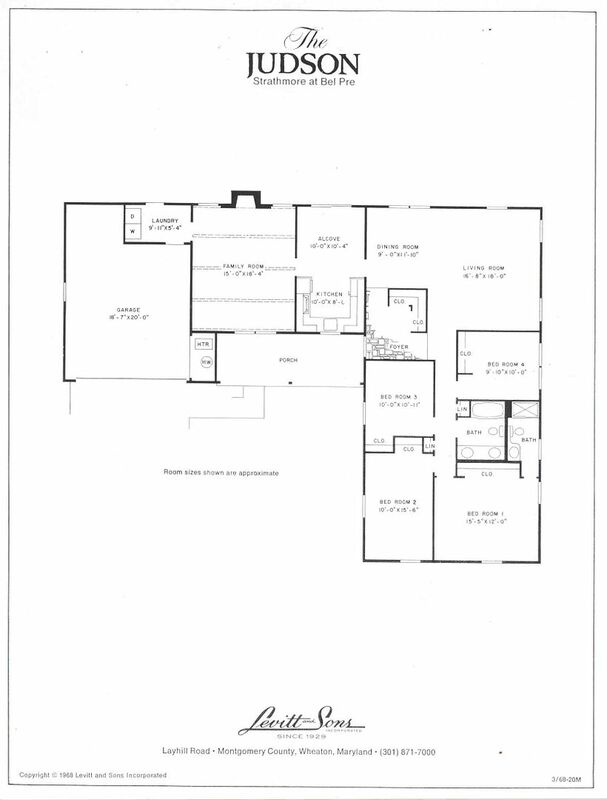 Inside, rooms are spacious and the floor plan is sprawling. Indoor contemporary features include an optional conversation pit--a sunken area of the living room around the fireplace with built-in cushioned benches. The Blair was the only traditional home at the time with this feature. 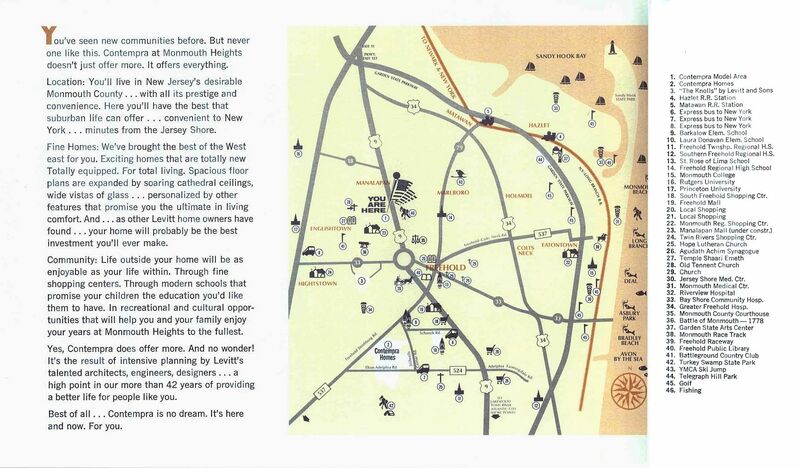 The Conversation Pit would not be seen again until Levitt unveiled its contemporary houseline in 1971. At the time the Blair model debuted, Levitt was just beginning to test true contemporary models--inside and out. That style would not enter the Levitt houselines until 1971--and last only a few years until inflation and high interest rates would necessitate more compact and simpler home designs.